A service led by Pastor Beeson at St. Matthew Trinity Lutheran Church in Hoboken, N.J., would look and sound familiar to most ELCA members, from its hymnals, to its weekly children’s message and sermon, to the celebration of communion. From a typical Sunday morning, it would be hard to imagine that this congregation made national news and broke ground that would have seemed unthinkable a few years ago, all while dealing with a shower of angry and hate-filled comments across social media. 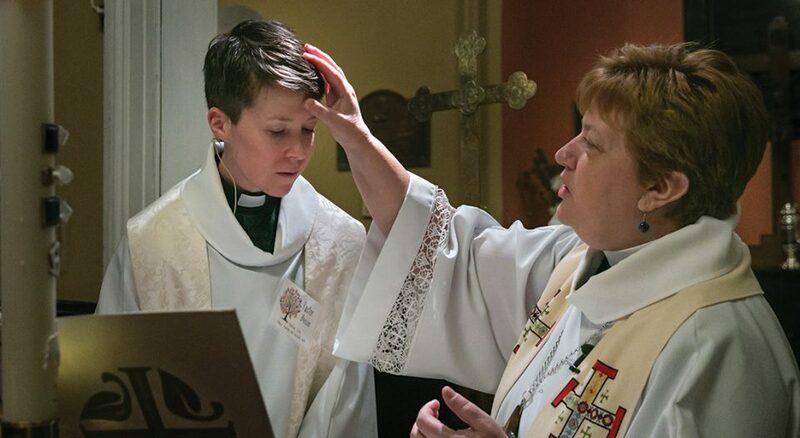 That is, unless you attended the service on Feb. 11 when the pastor, Rose Beeson, a one-time IT telecommunications worker who found the Lutheran church as an adult, changed his name to Peter in a renaming ceremony to reflect his transition from female to male. St. Matthew Trinity members were aware of their pastor’s transitioning. He had openly self-identified as queer for many years, and last summer during the “Stories of Resurrection” series, where members shared stories of a moment they had experienced new life, Beeson explained his journey of faith and of recognizing himself as transgender. Beeson said the congregation was fully accepting, which, given its reputation as a radically welcoming place, didn’t surprise him. But choosing to publicly transition remained a weighty decision. Beeson’s decision to transition wouldn’t have been accepted when he was young, growing up in what he calls a conservative evangelical denomination. But his faith was calling him into ministry even as a child. “The tradition I was part of at that time only allowed women to be missionaries or Sunday school teachers,” Beeson said. “I always figured someday I would grow up and be a missionary. When I left the church [and] came out as queer for the first time in my early 20s, that hope and plan vanished, and I did other things instead. Beeson believes it’s important for people who may be experiencing what he did to see that others find a path to fully being themselves. Not everyone who heard the news has been supportive, said Courtney Kochuba, a member of the congregation council. “On our social media there definitely are some trolls out there, and it got to me,” she said. “I reached out to the small committee that has been meeting since July to work with pastor. I said, ‘I don’t know if you’re seeing these Facebook comments coming in because I’m deleting them, but I need some help monitoring them because it is really starting to get to me.’ They all agreed. Beeson said it was helpful for him and the congregation to have a supportive bishop. New Jersey Synod Bishop Tracie Bartholomew, who called Beeson a “faithful, joyful servant of Christ,” believes the renaming ceremony was important for the church, and for her to be part of it. Beeson is comfortable discussing his story and differing viewpoints, and he hopes his story might help young people struggling with their identities. He also hopes his words may help during this time of increased hate crimes and use of derogatory language.